UCL postgraduate student Ying Lia Li (Lia) was one of five young scientists selected from applicants worldwide to present their projects at the recent Nature/Entrepreneur First Innovation Forum in Quantum Technologies. The Forum is designed to give young scientists a chance to get a better understanding of what a successful quantum technology start-up looks like and to discuss their ideas with leading figures from industry and academia. The Forum was supported by Innovate UK. Lia is studying for a PhD in optomechanics, working with Peter Barker, Professor in Physics at UCL. Her invention is an optical sensor that can measure acceleration, using the laws of quantum mechanics to make more accurate measurements than commercial devices on the market today. The sensor can be used for measuring gravitational field gradients, which is especially valuable when mapping out underground mines or oil reserves. It can also measure atmospheric drag in the Earth's lower orbit which is an important cause of satellite de-stabilisation. "It was an exciting experience taking part in the Forum. Being able to present a possible company idea in front of Sir Peter Knight (from Imperial College), Innovate UK and Nature editors is a unique opportunity," said Lia. "Many people on the panel and in the audience have direct impact on UK government spending on science." Lia is working with Peter Barker to secure funding for her project and hopes eventually to create a spin-out company to exploit her innovation. Lia has an MSci in physics from Imperial College and, after her graduation, worked at BAE Systems in Bristol for two years, in R&D and project management positions. 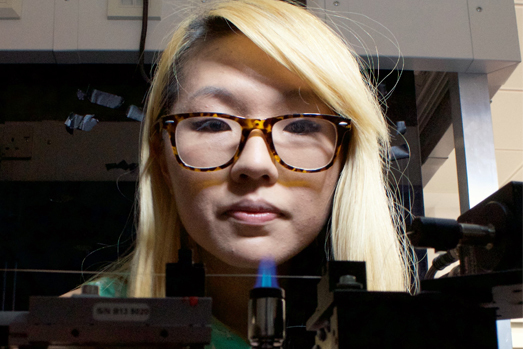 She holds a patent on shaping optical fibres. In 2012, she was a finalist for FameLab, a national competition to find the science communicators of the future.